888,000 CC & More Up For Grabs In Our Fortune Ang Bao Event! May the Year of the Pig bring you loads of luck and wealth in the brand new year! 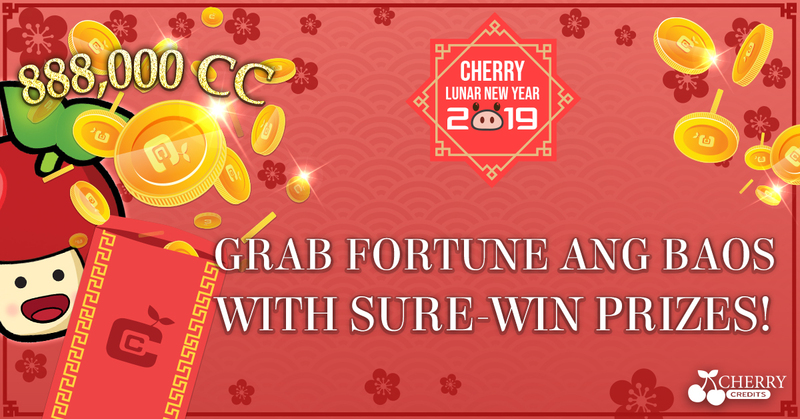 From 04 February 2019 0000HRS till 19 February 2019 2359HRS (GMT+8), kick-start the Lunar New Year in style with a daily chance to open the Fortune Ang Baos and grab rewards. Plus – you can get an additional Fortune Ang Bao opening chance with every 5,000CC spent in a single transaction! Step 2: Click on “Play”. The number of chances you have are displayed above the possible rewards. You will have 1 chance daily, which is reset by 0000HRS. Every 5,000CC spent during the event period also earns you an additional chance which will not be reset. Step 3: Say a little prayer and click on a Red Packet! Step 4: Once you get your reward, instructions on how to redeem it will be sent to your Cherry Messenger. For physical prize rewards, please reply to Cherry Messenger for collection details. May good fortune smile upon you! The Promotion will start on 04 February 2019 0000HRS till 19 February 2019 2359HRS. 1 Fortune Ang Bao opening chance is issued with every 5,000 CC consumed in a single transaction. Rewards are not transferable to another account. 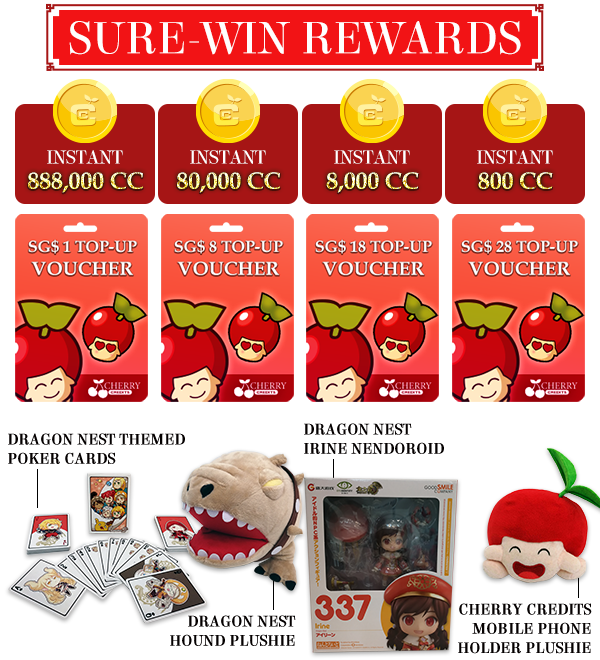 Rewards of CC will be credited directly into winners’ Cherry Accounts. Physical rewards (i.e. plushies, Nendoroids and poker cards) winners will be contacted via Cherry Messenger within 3 working days for delivery of prizes. Winners contacted are required to response within 14 days, otherwise reward will be forfeited. Voucher Rewards will be sent to Cherry Messenger in the form of voucher codes. All dispensed vouchers are valid until 28 Feb 2019 2359HRS. Unused vouchers will not be reimbursed. For top-ups in other currencies, voucher amount will be converted based on the exchange rate of the currency to be deducted off from the transaction payment. Vouchers can be only used on the following top-up methods: PayPal, Visa, MasterCard, WorldPay, iPay88, Alipay, Bancontact card, Sofortüberweisung, Dotpay, Paytrail, GiroPay, Sofort, iDEAL, Polish eBanking, WeChat Pay, China UnionPay, NETS Pay, mCoinz, NganLuong, VTC (epay) and Rixty. Only 1 voucher can be used in a single transaction. All timings stated are in the GMT+8 time zone. Any disputes will not be entertained 1 month after the transaction date. All decisions made by Cherry Credits are final. Terms and conditions are subjected to change without prior notice.